2020 Husqvarna 801 is old-school take on KTM’s 790 Adventure. With KTM sister-brand Husqvarna enjoying a resurgence thanks to its sharp individual take on the retro market in the form of their 401 and 701 Vitpilen and Svartpilen models, the platform engineering freight-train looks set to continue in 2020 with this 790-based adventure model. 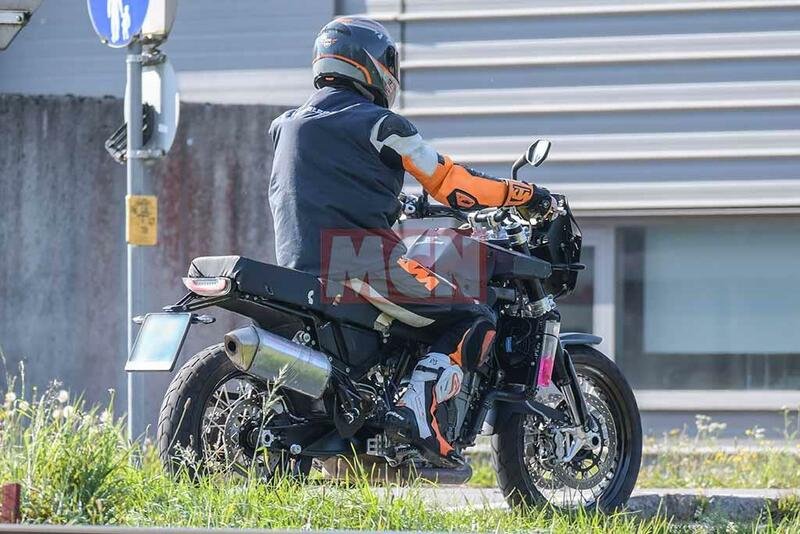 Expected to be the next new model in the Husky family, it will use the prefix 801 for variants borrowing the new-for-2018 790 parallel-twin engine that debuted in the Duke and has now found its way into the 2019 Adventure R.
Clearly building on the idea of an adventure bike, but applying Husky’s quirky styling cues that enable the two brands to share core components while offering potential buyers very different propositions – this is also obviously a very early-stage test mule. At its core is the main frame of KTM’s 790 Adventure, along with its 799cc parallel-twin engine producing 94bhp, fork, shock and braking hardware. The engine and front radial brake calipers carry KTM branding on the test mule, which would obviously not carry over to the production bike. The suspension, swingarm and wheels are all direct 790 thefts, too. Beyond these core shared items, the test mule veers off in its own direction. The 790’s upswept bolt-on subframe and seat unit are replaced with a flatter and squarer unit, offering rider and pillion a more traditional and comfortable perch, while the rear light has been poached from the 701 family. The face of the 801 is clearly redolent of the 701s’ too – being a large single round pancake LED stolen from the Svartpilen – complete with Husqvarna logo running across its centre bar. This is mounted in a very seventies-looking upright headlamp cowl, which could easily sprout a screen on the production version, while the KTM’s big low-slung petrol tanks are dropped in favour of a single large conventional tank position. We’d expect this to be revealed in full at the end of 2019 as a 2020 model. 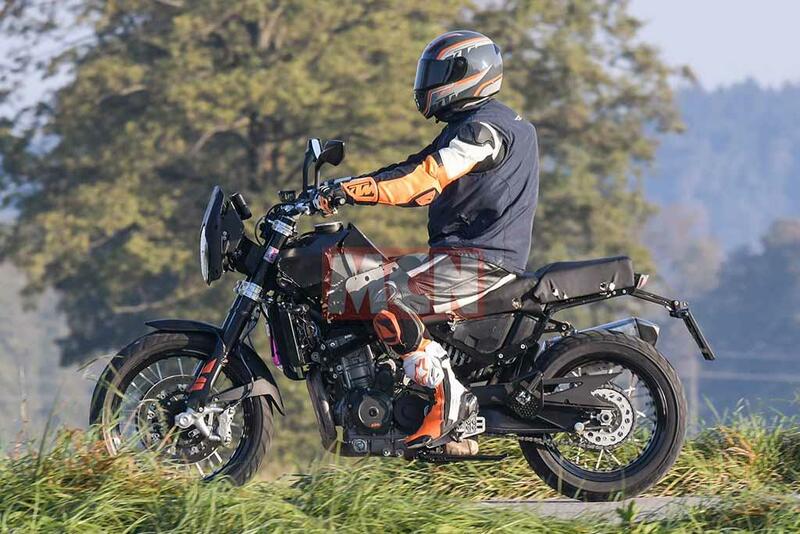 The main frame is identical to the KTM 790 Adventure, using the engine as a stressed member, but the bolt-on subframe is a different design, giving the 801 a distinctly different silhouette. The wheels, brakes, suspension and swingarm are all unchanged from the 790 that this test mule borrow so heavily from – but the tyres are different, running a more retro tread pattern. The dash appears to be a colour TFT unit lifted direct from KTM’s 790 Adventure and coupled – for now – to the existing KTM switchgear. Both are likely to change for production. 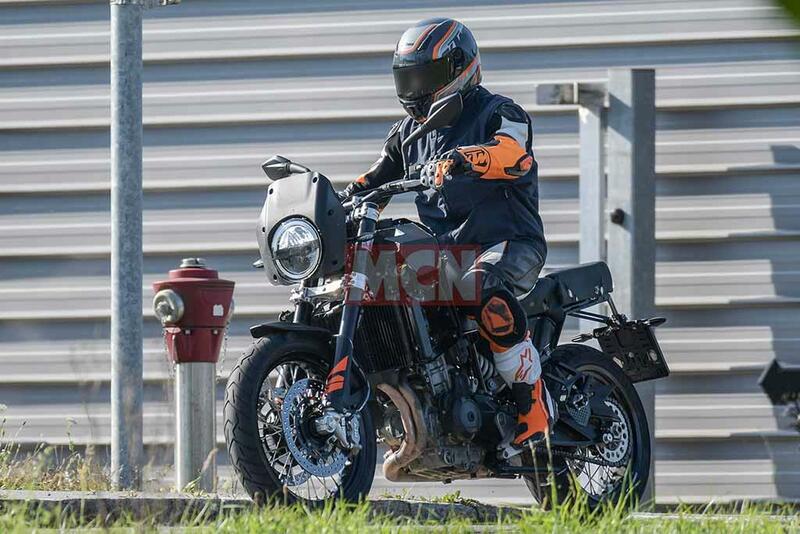 The exhaust system appears to simply be a rough pre-production version of the 790’s, but it’s interesting that they have maintained the high-level end can, suggesting this is the preference. The 790’s fuel tanks that mount low down each side of the water-cooled parallel-twin have been dumped in favour of a conventional tank that boasts the Husky trademark flanks. Browse for your next used motorcycle on MCN Bikes for Sale today.